The mission of the DOPPS Program is to improve the experience of patients with kidney disease by identifying links between international variations in clinical practices and outcomes. The studies within the DOPPS Program are designed to identify best practices for treating patients. Started as a hemodialysis study in 1996, the DOPPS has tracked over 120,000 patients on hemodialysis, peritoneal dialysis, and with chronic kidney disease, in over 20 countries. By observing patients over time, and correlating practices and outcomes in different medical settings around the world, the DOPPS helps researchers identify practices and other modifiable characteristics that improve patient lives. The PDOPPS is designed to advance the understanding of optimal practices for peritoneal dialysis patients worldwide. The CKDopps studies chronic kidney disease (CKD) treatment variation and aims to identify practices associated with the best outcomes for patients with advanced CKD. The DOPPS Practice Monitor (DPM) reports representative data in the form of more than 1,500 regularly updated charts, figures, and data tables, based on a sample of over 11,000 patients in more than 200 hemodialysis facilities. The DOPPS has a long history of successful collaborations with investigators around the world, including EURODOPPS, the UK Catheter Study, and more. 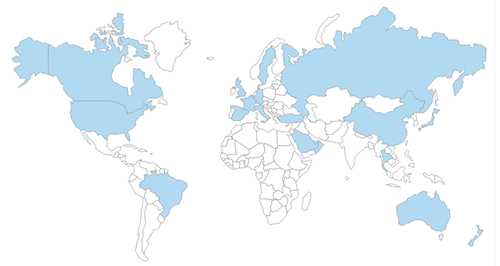 The DOPPS Program collects data in: Australia, Bahrain, Belgium, Brazil, Canada, China, France, Germany, Italy, Japan, Kuwait, New Zealand, Oman, Qatar, Russia, Saudi Arabia, Spain, Sweden, Thailand, Turkey, the United Arab Emirates, the United Kingdom, and the United States.